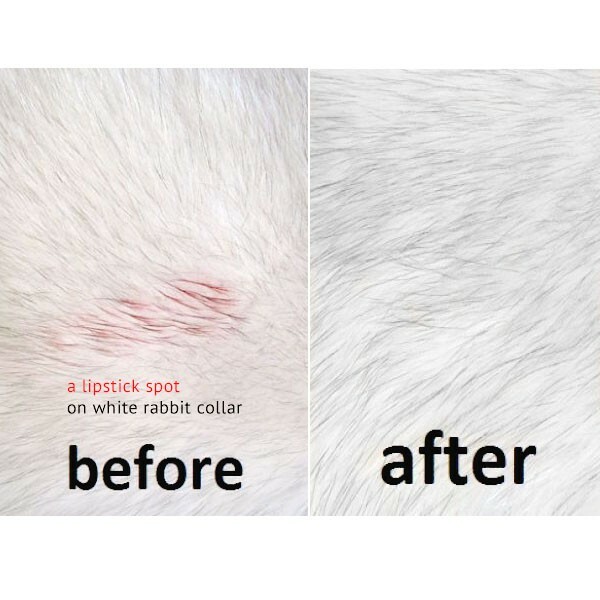 Lana's Instant Fur Stain Remover was designed for those unpleasant moments when you stain your fur on the spot. Clean makeup, lipstick, food, and fat stains yourself quickly, safely and easily when you need it most. For best results apply within 24 hours of stain occurrence. Our tough stain removal solution works on old stains as well. No one will care for your fur as carefully and promptly as you. Made my old fox fur very fluffy and light. Great communication & quick shipping! Remove makeup, lipstick, food stains, fat stains, etc. Also works great with high end natural clothing like wool, angora, etc. For the complete direction please click here to follow our easy steps for fabulous results. Use Only as Directed. If spray gets in eyes, wash out with cold water and soap. We all know how sad an unfortunate stain can make us feel, especially if it involves our favorite outfit. Lucky for you we have a solution that will restore your favorite fur garment and will cost only a small fraction of what professional dry cleaner charge. Just spray Lana's solution wherever it needs and follow quick and easy steps to remove stains on the spots such as makeup, lipstick, food stains, fat stains from your valuable fur garments. qWhich of your products will help remove slight discoloration from facial make-up? Our recommendation for fixing the facial make-up stains would be Lana's Stain Remover (LS-FNL-033) or Lana’s Fur Stain Removal Kit (LS-FNL-011). The kit additionally includes a fur brush and a pad for easy proper treatment of your fur. qI spilled Safeway no-sugar Raspberry drink on a light-colored sheepskin rug. Quite a big stain. Do you think your Fur Stain Remover Kit would remove such a stain? In this situation, for best results, we would recommend using Lana's Stain Remover (LS-FNL-033) on the stain, then wait about an hour or two and use Lana’s Sheep Fur Cleaning Kit (LS-FNL-014). You can also try using just Lana's Stain Remover and see if that will work by itself. However, it is always recommended to treat the stain as soon as possible to avoid further damage and setting in of stain in the sheepskin.